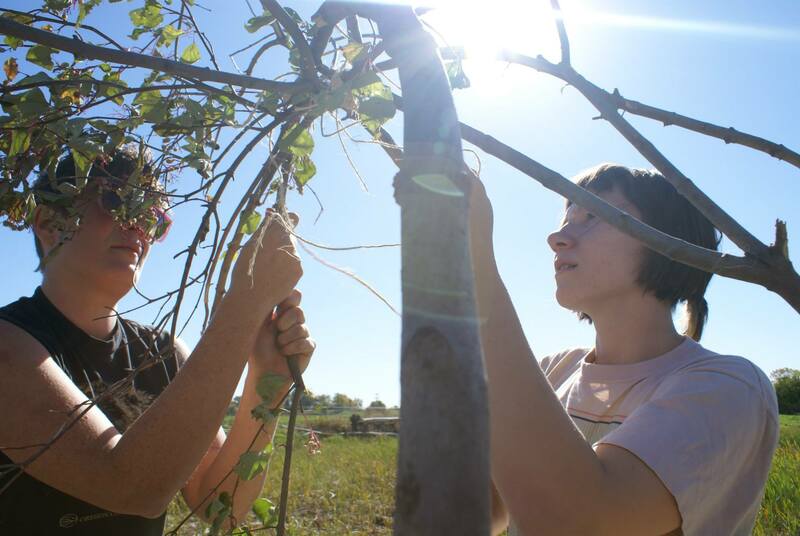 Structured as a collaborative, creative research group, Art & Ecology explores artistic responses to environmental sustainability and related social issues. In the first half of the semester, the course examines select themes in environmental discourse, paying particular attention to how artists have engaged them. In the second half of the semester, students develop collaborative or individual projects that may take the form of social/relational art practice, video, installation, performance, writing, sound, 2- or 3D forms, and/or electronic media. In-class activities are supplemented with field trips, screenings, and guest presentations, and special effort is made to connect students to university and community resources. Emphasis is placed on critical approaches rooted in the humanities, but students are welcome from all disciplines. Students from disciplines outside the arts are encouraged to contact the instructor prior to the first day of class. Note: This course first offered as Intermedia Topics before being overhauled to incorporate service-learning/community-based practice. It then became a regular course offering in Intermedia and part of the sustainability certificate program. Corinne Teed (MFA, Printmaking), Emma Steinkraus (MFA, Painting), and Angela Barr (BFA, Intermedia), “Beaver Memorial Lodge,” Fall 2013. Organizing over a dozen people to participate in the (community) building process, Teed, Barr and Steinkraus built a memorial beaver lodge to commemorate the Studio Arts’ beaver family that disappeared in the Fall of 2012, when Hodge Commercial Management decided to drain the neighboring pond. 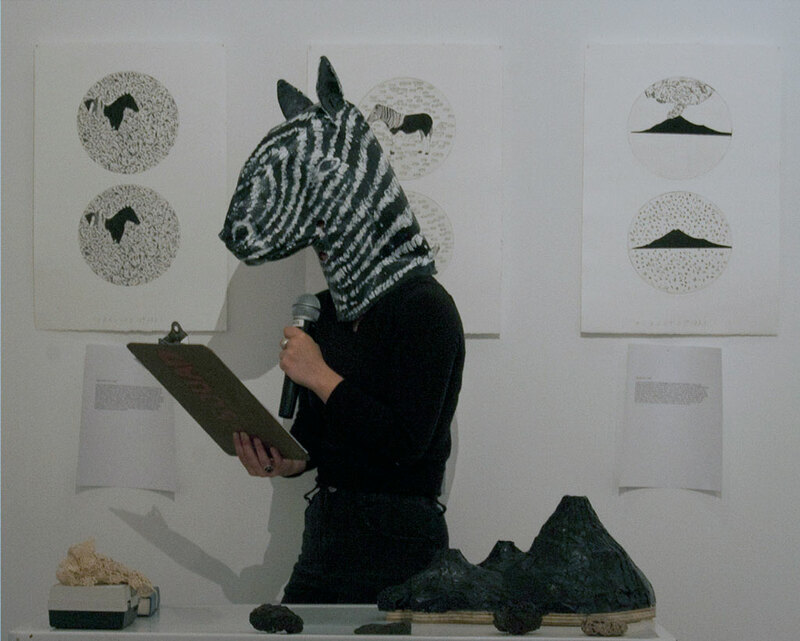 Sarita Zaleha (MFA, Printmaking), “Mourning Warming,” interactive/participatory, Fall 2013. 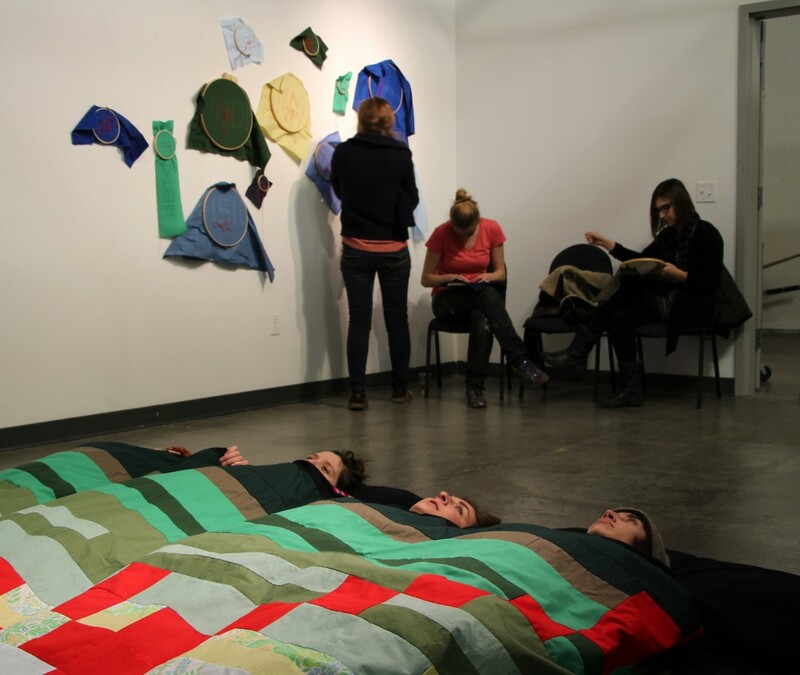 Global Warming Blanket, a sensor-activated heated quilt, positions participants as agents of temperature change. The rising temperature of the blanket corresponds to the data on global temperature increases, with 10 minutes of increasing blanket heat correlating to 100 years of global warming. The quilt-top is a graph of these global temperature increases from 1910-2010, showing an increase of roughly 1.5˚F over this time span. Scientists link the rise in global temperatures with increased frequency and intensity of hurricanes and typhoons. Brendan Baylor (MFA, Printmaking), Sarita Zaleha (MFA, Printmaking), and Anne Covell (MFA, Book Arts), “Listen,” architectural intervention, Fall 2013. Our seating/listening project’s goals were to make Studio Arts more habitable as well as connect others to the environment through sound. 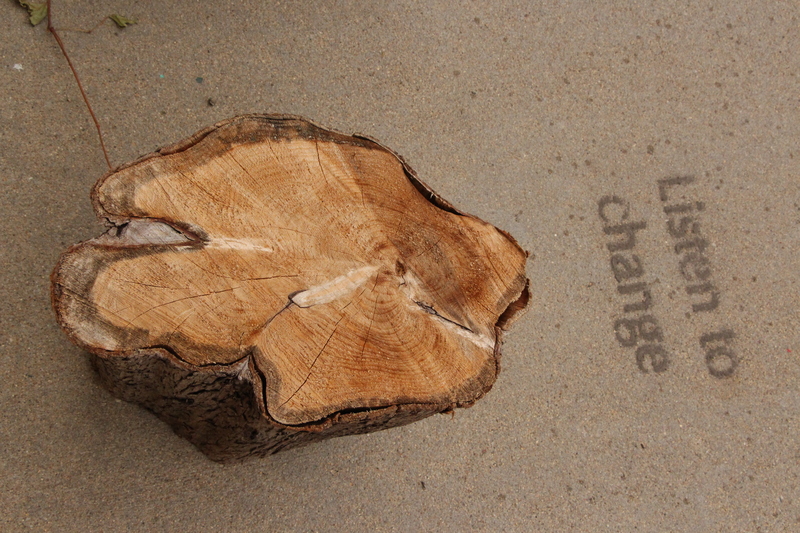 We arranged stumps along the front of Studio Arts and used mud to stencil text on the ground in front of the stumps. The text directed viewers/participants to listen to/for specific things that could be broadly applied (silence, atmosphere, pace, change, etc.). 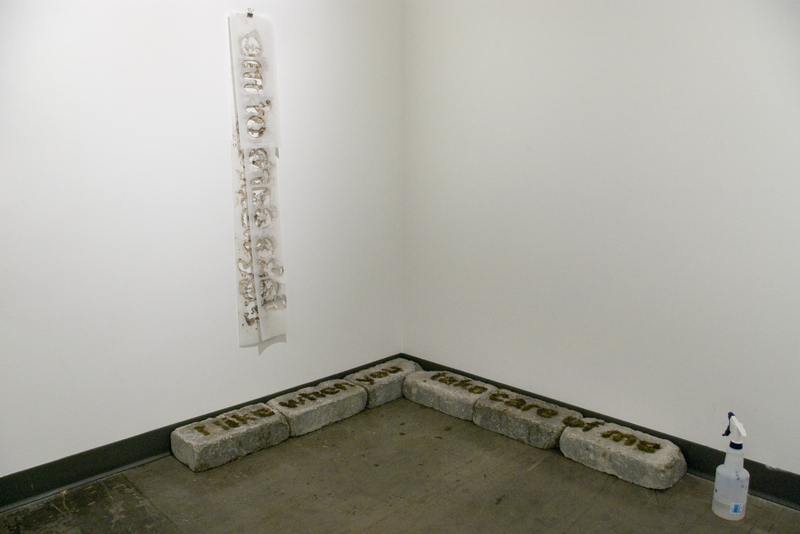 Brendan Baylor (MFA, Printmaking), “Contested Futures,” print-based installation with audio loops, Fall 2013. Contested Futures is an installation project charting the corn economies of Iowa and Illinois. Consisting of flexible modules of paper works, wall drawing, sculpture, and audio, this piece connects the infrastructure and ecology of Iowa and Chicago. Beginning with a scroll of the geologic time scale marking the minuscule duration of Euro-American settlement in Iowa, a single wire connects this piece to a network of speaker wire running throughout the gallery. 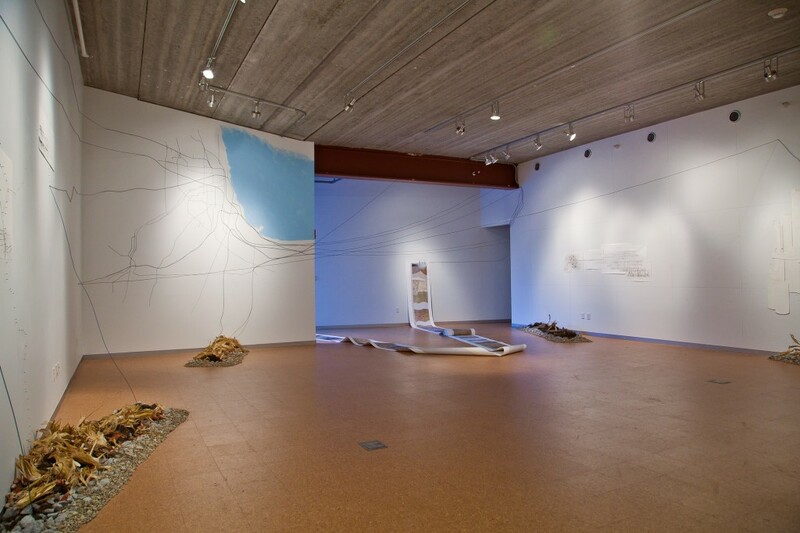 Taut lines traverse the gallery, intruding into the viewer’s space and connecting the dirt and corn of Iowa with the map of Chicago’s freight rail on the far gallery wall. These wires serve as conduits for audio loops: the opening bell and sounds of the exchange floor at the Chicago Board of Trade, and a list of corn-derived products being read by a single person. Looped beneath it are recordings of corn rustling in the wind and a group of people reciting a litany of prairie plant names. Fragments of the economic and ecologic life of the Midwest collide in the space, drawing in and pushing back viewers, guiding them through the sod-busted landscapes of Iowa and Illinois. 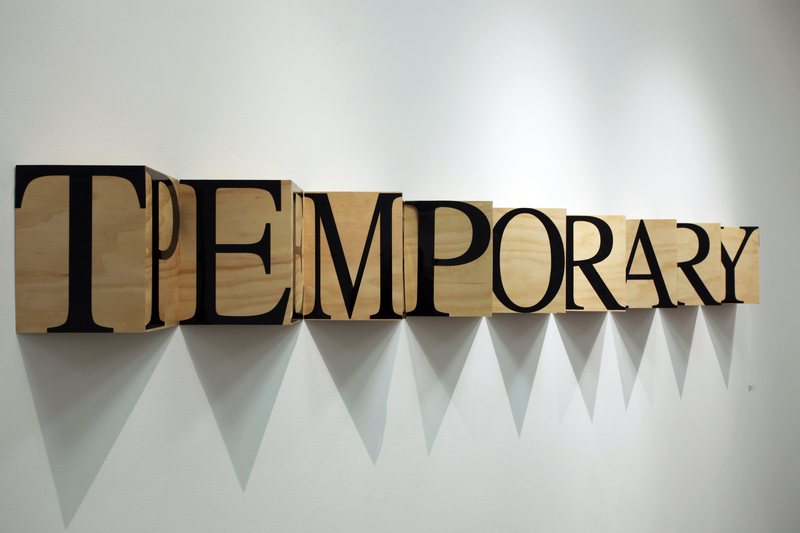 Daniel Feinberg (MFA, Sculpture), “Commensurate with Experience,” wall sculpture, Fall 2011. This wall installation questions to what extent ideas of being temporary or being permanent differ from one another, ecologically speaking. Temporary conditions have unforeseeable long-term effects; what we believe to be permanent in our human lifespan is but a blip on the scale of geological time. From a certain vantage point the two concepts might prove indistinguishable from one another. Erica Blair (BFA, Intermedia), “Waters Rising,” three audio pieces installed in Studio Arts Building, Fall 2011. 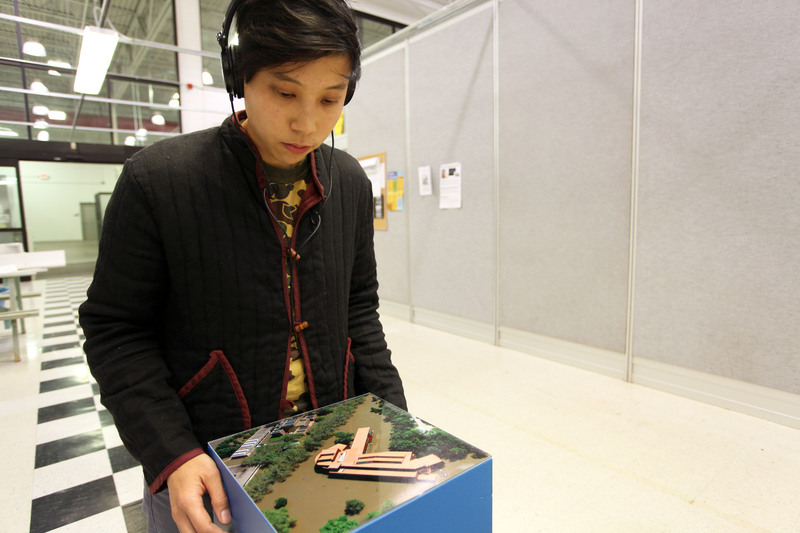 Three-part audio piece addressing the recorded history of Iowa floods, the process of moving the art school to its temporary location in a former Menard’s Building, and the future of the site when the school moves in 2016. 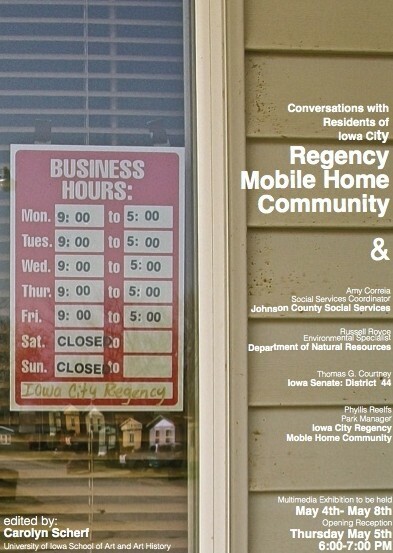 Carolyn Scherf (BA, Art), “Iowa City Regency Mobile Home Park Community Zine,” Spring 2011. Environmental justice zine containing statements from residents of Regency Mobile Home, interviews with representatives of Johnson County Social Services, The Department of Natural Resources, The Iowa Senate, Iowa City Regency Management, two sets of unanswered interview questions for The Des Moines Register and The Johnson County Board of Supervisors, Excerpts from Habitat for Humanity’s “A Study of Older Manufactured Homes in Johnson County: Too Dangerous to Ignore,” photographs and video stills from video footage of Regency.Printed and distributed to interviewees, residents, and made available to the public in Little Night Snacks and Chips machine in The Ark Gallery. This short documentary explores the spiritual energy and essence of Effigy Mounds National Park in Northeastern Iowa. The land is origin point for many tribal groups in the Midwest. Allison Kinney (BS, Environmental Studies), “A Lot of Tator Tots,” Spring 2011. 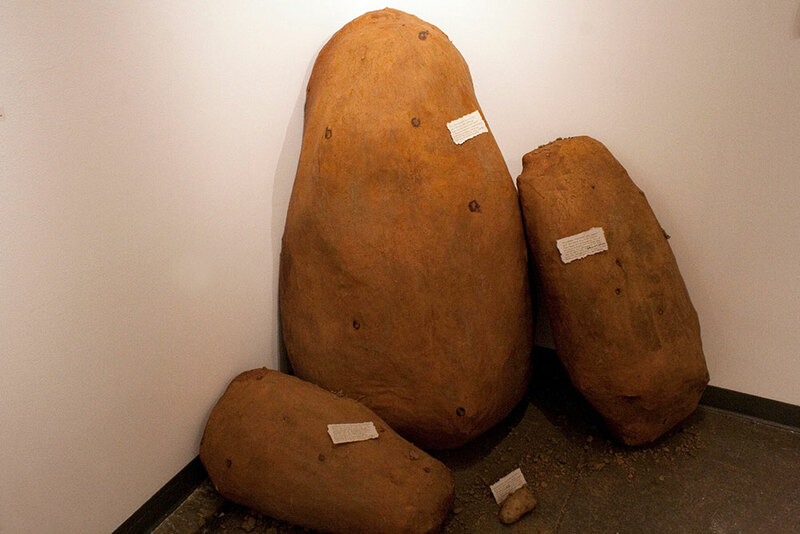 Scaled paper mache potatoes representing the number of steps in the supply chain of 4 different potato-based meals. Fast Food French Fries (61x34inches), Mircrowaveable Organic Meal (34x17inches), Industrially grown whole potato (42x26inches), and a locally grown organic whole potato (real potato used, approximately 4×2.5 inches). All materials were recycled and/or locally sourced. 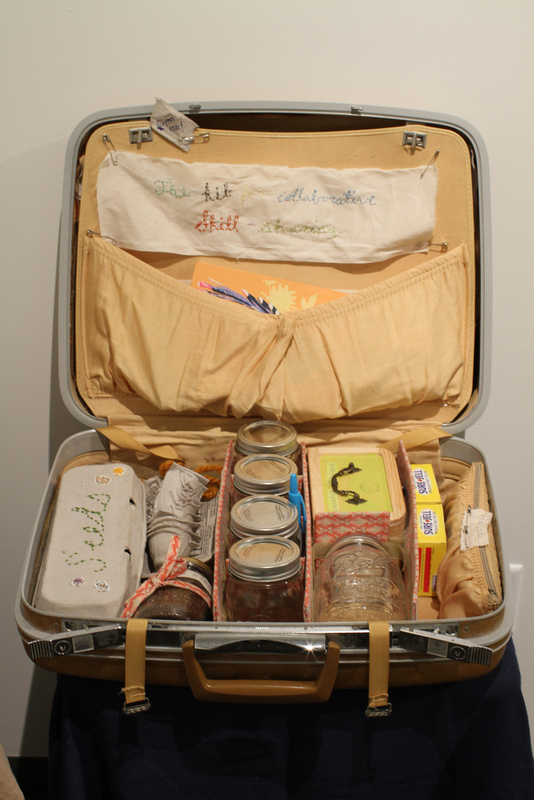 Taryn McMahon (MFA, Printmaking), “I Like When You Take Care of Me,” living moss stencils, Spring 2010. Left: Caitlin Digman (BFA, Sculpture and BS, Environmental Science) and Ellis Mumford (BA, Art History), “Homesteading Skill Kit,” Spring 2010. 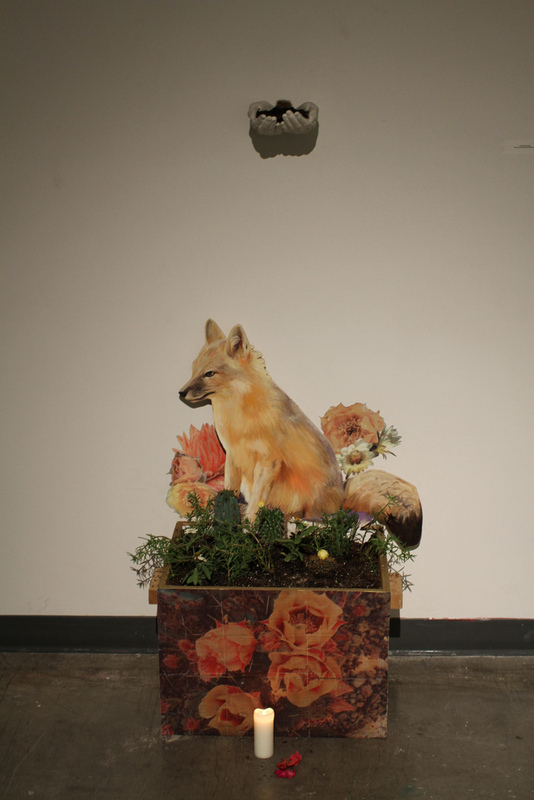 Right: Lisa Rowley (BFA, Painting), “Fox Shrine,” Spring 2010.